IMS™ Version 11 continues to provide the leadership in performance, reliability, and security that is expected from the product of choice for critical online operational applications. IMS 11 also offers new functions to help you keep pace with the evolving IT industry. Through the introduction of the new IMS Enterprise Suite application developers with minimal knowledge of IMS Connect can start developing client applications to communicate with IMS. 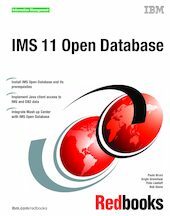 With Open Database, IMS 11 also provides direct SQL access to IMS data from programs that run on any distributed platform, unlocking DL/I data to the world of SQL application programmers. In this IBM® Redbooks® publication, system programmers get the steps for installing the new IMS components, and the application programmer can follow scenarios of how client applications can take advantage of SQL to access IMS data. Our scenarios use the JDBC driver for type-4 access from Windows® to a remote DL/I database and DB2® tables and extend it to use IBM Mashup Center to provide an effective Web interface and to integrate with Open Database. Important: IMS Enterprise Suite V2.1 is the last release of the IMS Enterprise Suite that includes the DLIModel utility plug-in. Customers should migrate to using IMS Enterprise Suite V2.2 or later, which includes the IMS Enterprise Suite Explorer for Development. DLIModel utility projects can be imported into new IMS Explorer projects. In this book, any references to generating IMS metadata classes by using the DLIModel utility are comparable to the actions used to generate the classes using the IMS Explorer for Development.